Aluminium AB Series Oil-lubricated (2-3 hp / 1.5-2.2 kW) 10 bar (145psi). Atlas Copco Automan professional series is designed for applications where you need reasonable flow rates and a reliable source of compressed air for shorter periods during your work. The Automan series is perfect for the professional or serious DIY builder that needs air for nail guns or pneumatic tools as part of their work. With its aluminium design it is the perfect air compressor for mobile use. Aluminium AB Series Oil-lubricated (4-10 hp / 3-7.5 kW) 10 bar (145psi). 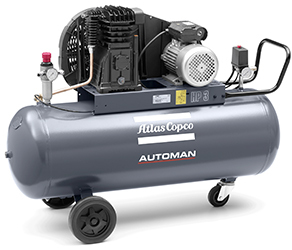 Atlas Copco Automan industrial Aluminuim series is designed for applications where there is a regular reliance on compressed air. 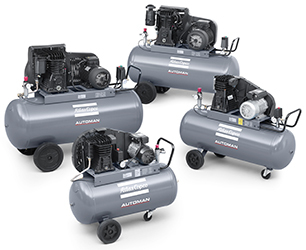 The Automan piston compressors are built for regular usage and is perfectly suited for the Australian market. The aluminium design is a lighter weight option and provides easier mobility. The industrial Aluminium series is the perfect choice when you have higher compressed air demands and portability is needed. Cast Iron AT Series Oil-lubricated (5.5-10 hp / 4-7.5 kW) 11 bar (160psi). 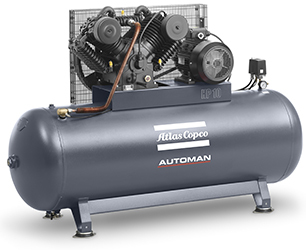 Atlas Copco Automan industrial+ series is designed for applications where there is a regular reliance on compressed air. The Automan AT Cast Iron piston compressors are built for regular usage and with its cast iron blocks it is perfectly suited for the Australian market. Designed and built in Italy, the Automan Industrial+ series is the heavy duty cast iron piston compressor that stands out as a workhorse in industrial settings. AC Series Oil-lubricated Honda Motor Driven (4.8-7.1 hp / 3.6-5.3 kW) 10 bar (145psi). Atlas Copco Automan petrol series is designed for applications where you need reasonable flow rates and a reliable source of compressed air for shorter periods during your work. The Automan series is perfect for the professional or serious DIY builder that needs air for nail guns or pneumatic tools as part of their work. 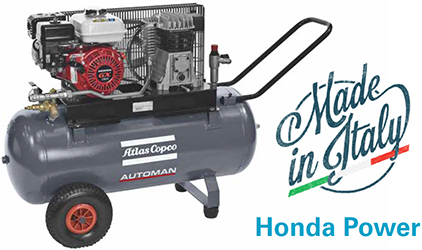 With its aluminium design and pull start genuine Honda petrol engine it is the perfect air compressor for mobile use or mounting to ute tray or trailer. LE & LT Series lubricated Piston Compressors (2-20 hp / 1.5-15 kW) with 10-30 bar (145-435psi) options. 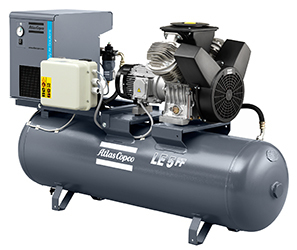 An Atlas Copco LE/LT compressor is your high performance industrial air solution. Designed with the highest attention to quality, Atlas Copco’s LE/LT oil-lubricated aluminium piston compressors stand for exceptional reliability and low operating costs. The 10-bar LE and the 15/20/30-bar LT generate quality air at the lowest operating temperatures in the industry and with minimal oil carryover. Their proven design and quality materials deliver premium operation and an extra-long life. P.O.A. G 2-5, G 7-11, G15-22, G 30-45 (3-60 hp / 2-45 kW) with 7.5-13 bar (109-189psi) options. 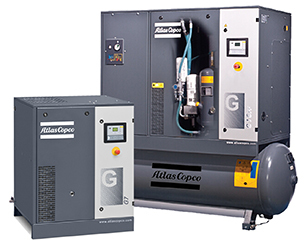 Atlas Copco compressors have always set the standard for reliability and performance in the compressed air industry. With the new G 2-5, G 7-22 and G 30-45, Atlas Copco Brings the power and durability of an industrial screw compressor to any type of small or medium sized industry. G Series are available as stand-alone floor packs, tank mounted or full featured tank mounted units with an integrated dryer for a remarkably compact footprint. G2-5 all 10bar, G7-45 available from 7.5bar to 13bar options. P.O.A We recommend a site visit to determine correct sizing. Can’t find your Atlas Copco product?